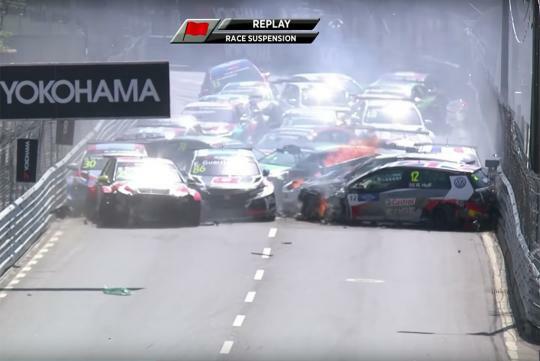 The race was stopped on the first lap of last weekend's Portugal leg of the World Touring Car Cup as a huge crash involving multiple cars happened. Rob Huff, who was in pole position, came into his Volkswagen teammate Mehdi Bennani after running side by side through the first couple of corners. Upon reaching the third turn, Bennani knocked into the left rear side of Huff's Golf GTI and before you know it, everything one started crashing into each other. Thankfully no one was hurt but both Golf GTI had to be written off as reported by Autosport. Huff was very thankful that rivals Gabriele Tarquini and Yvan Muller came over to attend to him immediately after the crash. "I'd like to say a huge thanks to Gabriele Tarquini," added Huff. "I was very winded after the crash and couldn't get out of my car, and with the engine oil spilling it was on fire, he quickly came over and helped me get out of the car and stayed with me in the few minutes before the medical teams arrived. "Also thanks to Yvan Muller, who came to help out; it just shows that even though we're all rivals on the track, there's a great camaraderie between us all." After the track was cleared, the race resumed and Yvan Muller finished first in his Hyundai i30 N.